TEAC AI-301DA review | What Hi-Fi? There’s plenty to like about the AI-301’s smooth, full-bodied performance. The rounded quality smoothes off any rough edges a song may have. Admittedly, this means the TEAC isn’t the most transparent or revealing of amplifiers, but it does make it easy to listen to. There’s warmth and weight to alt-J’s Fitzpleasure, and the abrupt dynamic shifts are relayed with an easy-going attitude. While it can’t match the scale and openness of the Monitor Audio Airstream A100’s sound, the TEAC does a good job of creating a wide soundstage. Detail definition is decent. The TEAC’s sonic characteristics remain consistent when switching between sources, and from a CD-ripped WAV file to a high-res FLAC file. It’s only when you switch to Bluetooth does the TEAC falter. It sounds less solid, and less lively. Play I Am A Man Of Constant Sorrow (FLAC, 24-bit/96kHz) from a streamer, and the folky-bluesy tune jauntily jangles along with rich guitar strums and clear, direct vocals. While we like the detail and clarity of the expressive voices, the TEAC does have a tendency to push the midrange, and thereby voices, a bit too far forward. We prefer that to a lacklustre delivery though, and it bodes well for vocal-heavy songs. While there’s plenty to keep you listening for hours, the TEAC’s sense of rhythm isn’t quite as confident or precise. It struggles to control all the elements in the complex arrangement of The Dead Weather’s 60 Feet Tall. The NAD D 3020 easily delivers the punchy and taut music with all cohesion and tension intact. The TEAC is s a rather ‘safe sounding’ amplifier. This is by no means a bad thing – we like how there’s no hint of a hard or bright edge. Nor does the amp subject us to a plodding, lumpy low end, either. But we want a little more pizzazz. That exterior is certainly traditional, but underneath it’s a different story. 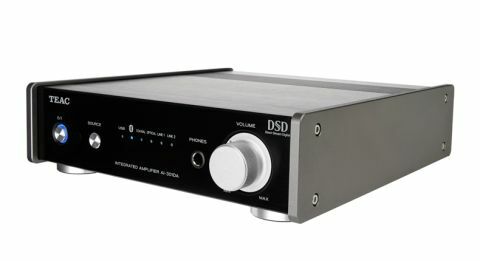 The AI-301DA has a Class D amplifier outputting a claimed 60W per channel, a high-res Burr-Brown DAC, and an asynchronous USB input. But that’s just the start. The single coaxial and Type B USB inputs support hi-res files of up to 24-bit/192kHz, while the optical input is limited to 24-bit/96kHz. There are also two pairs of RCA line-level inputs on the back panel, while a subwoofer output is available if you want more oomph. The metal build is sturdy, while the aluminium faceplate looks classy in black or silver. The volume dial is perfectly weighted and has a nice tactile feel when turning it up – it’s great to use. The power and source buttons respond swiftly, as does the somewhat chunky, but small remote control. It fits neatly in our hands. The TEAC amp faces stiff competition from the likes of NAD and Monitor Audio. But despite its unadventurous presentation, it’s still a warm, smooth sound that’s really easy to listen to. Let’s not forget its sturdy chassis and extensive file compatibility. Give the AI-301DA a whirl – you may just find it pleasant company.